🎹 UPDATED REVIEW - March 25, 2019 - BEST Digital Pianos under $2000 down to $1000 - My name is Tim Praskins and I am an expert when it comes to playing, teaching on, and knowing about digital pianos. I have been working with all the brands and models for over 40 years playing them professionally, teaching lessons on them, and advising people all over the world on what would be best for their musical needs. 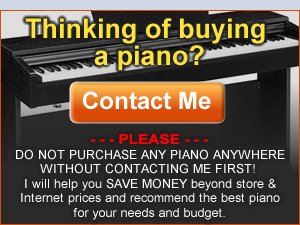 I offer free, personal piano buying advice no matter where you live and can also help you purchase new digital pianos for less money than internet price, Amazon price, store price, and used/demo model price if you are in the US. Many (but not all) of the digital pianos for 2018 continue as current models in 2019 although there are a few changes and new models coming out in all price ranges. When that happens I will review those pianos and have that info on this blog so that you can know more about them. Just email me with your questions and I'll be happy to get back to you, or you can call me if you are in the US. (International replies by email only and will take longer for me to reply). There are many new model digital pianos being offered by the top piano manufacturers these days and sometimes it can be very confusing as to what the best digital piano is for a particular price range. So I have written this blog article (and others) to help out people looking for good cabinet model digital pianos between $1000US - $2000US. I also have done a review comparison of new digital pianos under $1000US which you can also read about on my blog at the following link: Digital Pianos under $1000US. 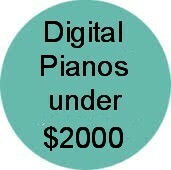 I consider the top digital piano manufacturers in this price range to include Kawai, Casio, Yamaha, Korg, and Roland. 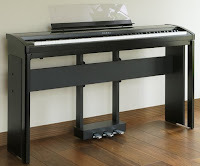 In the $1000-$2000 price range, the Korg digital piano company makes 2 cabinet pianos called the C1 Air and G1 Air which are very impressive for the money and I talk about them later. The Kurzweil piano/keyboard company makes nice looking furniture style digital pianos and although a few of them sound pretty good overall, there are others that just have too many deficiencies to be a real contender and are not very good when it comes to better quality piano sound, key actions, and pedaling system in the under $2000US price range. I have done a few reviews of Kurzweil pianos on this blog if you want more info but overall I don't recommend them, especially as compared to the top brands I just mentioned. Almost all other brands of digital pianos (with a couple of exceptions) that may be available in some piano stores, on-line web sites, or consumer store web sites (like Costco in the US) are what I consider to be off brands. I would definitely not recommend these brands (at least not in the models they have out now) by such names as Artesia, Suzuki, Williams, Adams, Adagio, and a few others that I have seen and played. 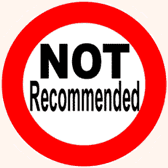 Stay away from them regardless of how inexpensive the price may be or how attractive the piano may look if you want a good piano playing experience, especially in these mini/micro digital baby grands that are out there. Many of them are just plain bad when it comes to key action response, dynamics, key action noise, durability, etc. I have written reviews on many of these brands and models so if you want more info, take a look at some of my other blog reviews. 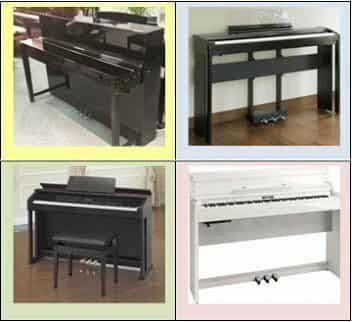 In this blog article I will be referring only to furniture cabinet style models (including portable pianos with nice furniture stands & pedals) and only those that have an internet or regular store discount price for $1000-$2000US which is where most consumers want to be when shopping for a new digital piano. Roland digital pianos are fine instruments and that brand traditionally offers most of their digital piano models for well above $2000 and are thought of as a "higher end" company. 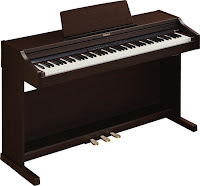 However, Roland does have 3 newer model furniture cabinet digital pianos and one new self-contained portable model (furniture stand & pedals optional) which sell between $1000-$2000 and they're called the F140R ($1199US internet price), the RP501R ($1499 internet price), the new FP90 ($1799 internet price) self-contained portable piano (furniture stand & pedals optional). 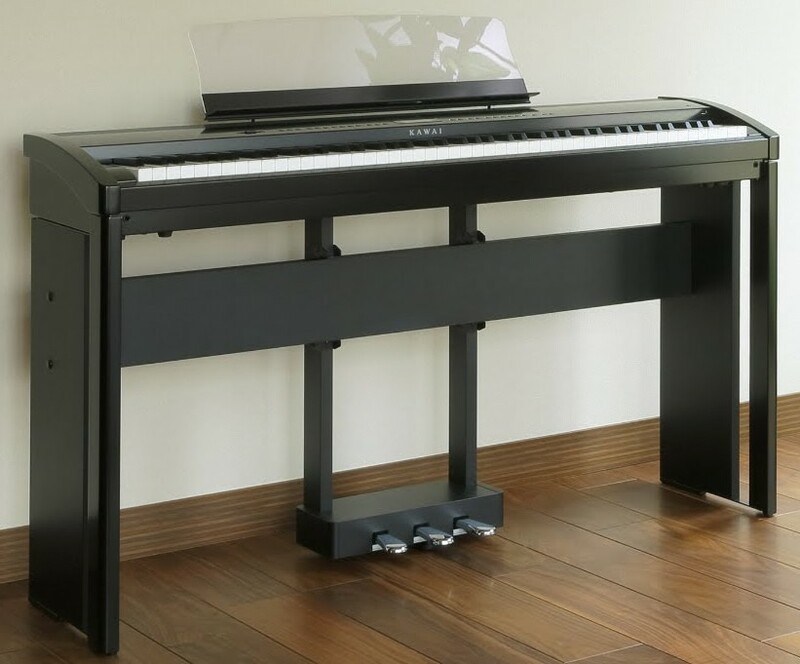 The RP501 is the identical piano as the previous RP401R with the exception that Roland replaced the WiFi technology with Bluetooth (but not Bluetooth audio streaming), and Roland changed the shape of the speakers in the RP501 and the piano is made in a different Roland factory. The RP501R and F140R are identical models in different cabinets and have upgrades over previous Roland pianos in this price range in past years. Roland is a very good value for the money and and are quite popular throughout the world. Roland has a newer portable model called the FP60 ($1399 internet discount price) which has a lot of similarities to the RP501R using the same key action and piano sound technology but having upgraded abilities, features, and polyphony. So when it comes to a higher quality portable digital piano, the FP60 would be a good option although for me personally, the piano sounds are still too brassy and bright overall and similar to the FP 30 $699 internet price) in that way. Of all the Roland models under $2000 it seems that the more advanced FP90 is the most popular given what it offers in this price range ($1799 internet price) and comes in an attractive compact portable cabinet and I have done a recent review of the FP90 so look for it under my "search reviews tab." The thing that makes this brand a strong competitor is the realism of the piano playing experience among other things. Although all of these models have some unique and useful digital features, it's really the piano sound, key action, and pedaling authenticity that many people enjoy in this price range. I have played Roland home and stage pianos professionally for many years (along with other brands) and have enjoyed playing them. Roland is not as well known outside of the electronic music business because they do not produce regular acoustic pianos like Yamaha or Kawai and don't build many non-musical consumer products like Casio does. Roland concentrates on producing pianos for musicians as well as recreational (and beginner) students & players who want higher quality technology in a musical instrument that is generally easy to use and in a reasonable price range. As with my other recommended brands here in this price range, Roland is a Japanese company and a good one, but is not as well known in the mainstream consumer market as compared to huge companies like Yamaha and Casio. But it's not about how big you are but it's about how good you are:). I have detailed blog reviews on all of these new Roland models here on this blogsite if you want to read more about them. Yamaha offers 5 current model furniture cabinet digital pianos starting at $1099US and going to just under $2000US and they're called the YDP143 ($1099US internet price YDP163 ($1299US internet price), YDPS52 compact model ($1349US internet price), YDP181 ($1699US - below left pic), and YDPV240 ($1999US internet price). The Yamaha Arius YDP181 piano (left pic) has been one of the more popular Yamaha pianos under $2000 and sells at a US internet discount price for $1699. 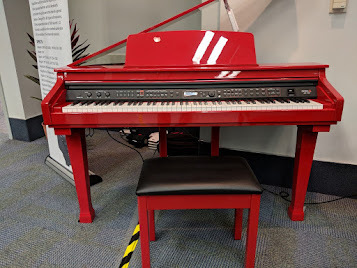 This piano is carried in many music stores and on-line internet dealers throughout the country and the piano key action is good, but not as realistic in my opinion as the new Casio AP470 or Korg G1 Air. When it comes to comparing any digital piano including Yamaha to real pianos, acoustic pianos are organic instruments made mostly of wood parts so that's why many acoustic piano shoppers will try out two or three of the same model acoustic piano in a store as each one can be slightly different in feel or tone. The feel and tone is different from one brand to the next, so "true piano tone" is relative, but the YDP181 does have a good piano tone although its a bit mid-rangy in my opinion because of the speaker system design (the sound is much better through a good pair of headphones). The YDP181 offers 14 instruments on a nicely laid out control panel with easy access buttons, and the acoustic piano tone is fairly realistic although the tonal dynamic range is somewhat compressed in my opinion, but all of the sounds are better through a good headphones. The YDP181 also has a layering feature but no split or Duo play. Unfortunately this piano does not have a high speed USB output which would have been a convenient option and is available on all the other Yamaha models. This is because the YDP181 has been around for many years and I am guessing it should be discontinued soon for an upgrade at this point. It does have a useful USB flashdrive input so basic MIDI song recordings can be saved and stored to flashdrive (it does not play General MIDI files). The YDP181 has a 2-track MIDI recorder for separate right and left hand recording and playback which is great. As far as looks, it might be slightly better looking than the Roland as far as furniture cabinet and is offered in the simulated dark rosewood finish only, as opposed to some models which also offer a black color. The Yamaha YDP163 came out well after the YDP181 and that model is less money than the YDP181 and in some ways even better. The Yamaha pianos are quite good but in my opinion don't compete with what Casio, Kawai, and Roland has to offer under $2000 at this point, especially in the key action movement and tonal dynamic range. The Yamaha Arius key actions, especially on the YDP163 and YDP181 are a bit too stiff/resistant when you press down the keys from a resting position (static touch weight), especially when playing lightly or softly. The Casio, & Kawai pianos are a bit lighter and move more easily in that way but overall the Yamaha pianos are very nice, are durable, and made well. 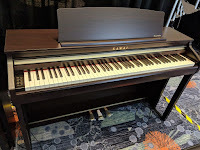 Kawai produces four digital furniture cabinet pianos under $2000 called the CE220 (1899US internet price), the ES8 compact, portable piano ($1649US without optional furniture stand & pedals), the CN27 ($1899US internet price), and the the KDP110 ($1199 internet price), with the KDP110 only available in dark brown rosewood & CE220 piano in matte black. The CE220 has real wood acoustic piano keys although it is an upright feel key action movement as opposed to grand feel and the keys are a bit firm to push down which can be a limitation to some people whether they are beginner or advanced. The piano tone is very good and it has a larger 192-notes of polyphony piano sound memory which is plenty for nearly all playing situations. The features that Kawai offers on the CE220 piano are useful as well. All of the control buttons are across the front of the piano and they're easy to see and use. The CE220 is capable of layering and splitting two tones and it also has some other cool things like octave shift when layering two sounds together which none of the others can do. The CE220 has duet 4-hand play which means two people can play the piano at the same time by splitting the piano keyboard into 2 equal keyboards playing in the same octaves which is very cool. It has 22 realistic instrument tones (22 is good and better than Yamaha), has 100 realistic drum rhythm patterns for rhythm & timing practice, a layer relative volume balance slider control (the only piano to have that), and a 2-track recorder for separate right and left hand recording and playback. The CE220 also has a USB output to connect to computer for interfacing with music software and a USB flashdrive input for storing recorded songs as well as loading in MIDI piano song files for playback. And as far as looks, I think the Kawai CE220 is attractive and looks more substantial than some other pianos. I would recommend the CE220 for what it offers. Casio has 3 cabinet pianos right now between $1000-$2000 including the new lowest priced Celviano AP270 ($1049US internet price), the new Celviano AP470 ($1499US internet price - left pic), and finally the Celviano AP650 ($1899 internet price) that is my pick for "best bang for the buck" in this price range under $2000 for a cabinet model digital piano . I have played all 3 models many times, but with regard to the Celviano AP650, in my opinion the keyboard touch, response, and key movement is surprisingly good and provides a fairly realistic acoustic piano playing experience along with the keytops having a Casio proprietary synthetic ivory & ebony material for smoother finger movement and control. There are 250 instrument sounds utilizing 256 notes of polyphony for advanced piano sound reproduction, along with a wav file audio recorder and playback feature which you can save and load to a USB flashdrive. The pedal movement and sustain/decay time is good in this price range and the piano even has damper & string resonance which produces the natural echo and sympathetic vibrations found in a real acoustic piano when pressing down on the damper pedal or playing the notes and hearing the strings vibrate. 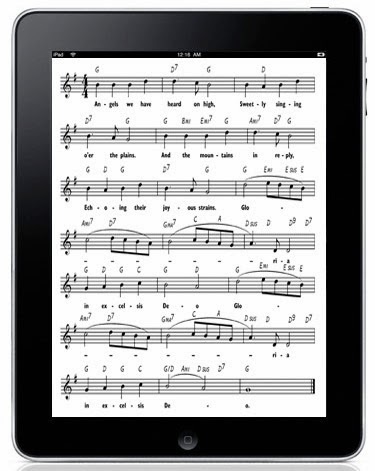 Other features include duet four-hand play, layering, splitting, transpose, and many other cool things. The control buttons are across the front of the piano so it's user friendly and intuitive to use. Casio has also included some advanced tech features like USB CoreMIDI connectivity (very nice for plug & play connection to iPad and computer) as well as having audio outputs. The AP650 audio speaker system is surprisingly powerful at this price and includes four speakers going through 60 watts of stereo power with a lid opening feature which allows the sound to project more in an acoustic piano fashion. 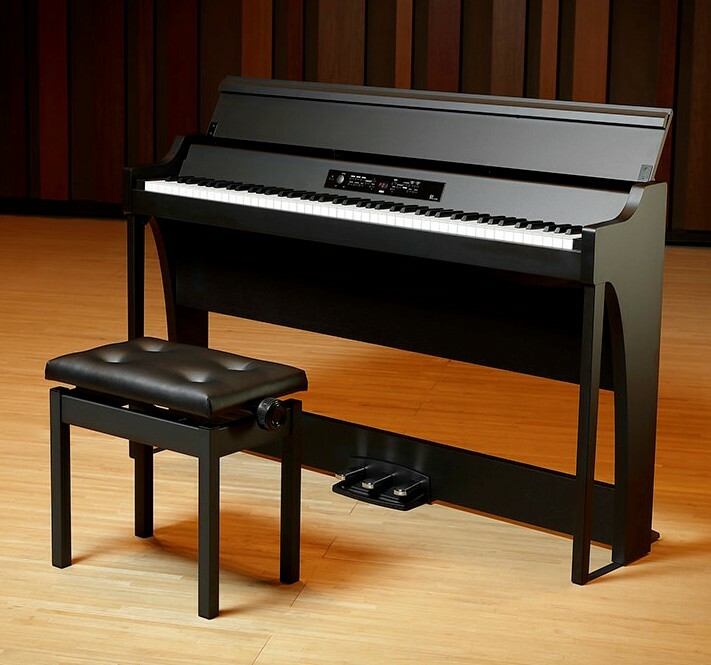 The AP650 gives you the sense you're sitting in front of a real piano and it looks attractive in its furniture compact cabinet with sliding key cover and front designer legs. So for its $1899US internet discount price, this piano is a very impressive package and a great "bang for the buck" as far as I am concerned. Go to the following link to read my Casio AP650 review: Casio AP650 Review. Go to the following link to read my review of the new Casio AP470: Casio AP470 Review. Go the to following link to read my review of the new AP270: Casio AP270 Review. ***Please make note that in reality all of these top models are interchangeable in their rating order because they are all from each other in a number of ways and all very good. So for some people what I call #1 on my list could be #4, and what I call #4 could be #1, it really just depends on your musical goals, abilities, uses for the piano, and your budget. As I said, it really is difficult to objectively rate digital pianos because their prices and features are so diverse and that's why I believe the top 5 models can be switched around in order depending on your needs and budget. The Kawai Kawai ES8 key action is perhaps more authentic than the Casio AP650 in my opinion as well as their acoustic piano sound, but for most people they may have a difficult time discerning those differences so could likely be happy on any of them depending what kind of cabinet they prefer...but the fact is that there definitely are differences. 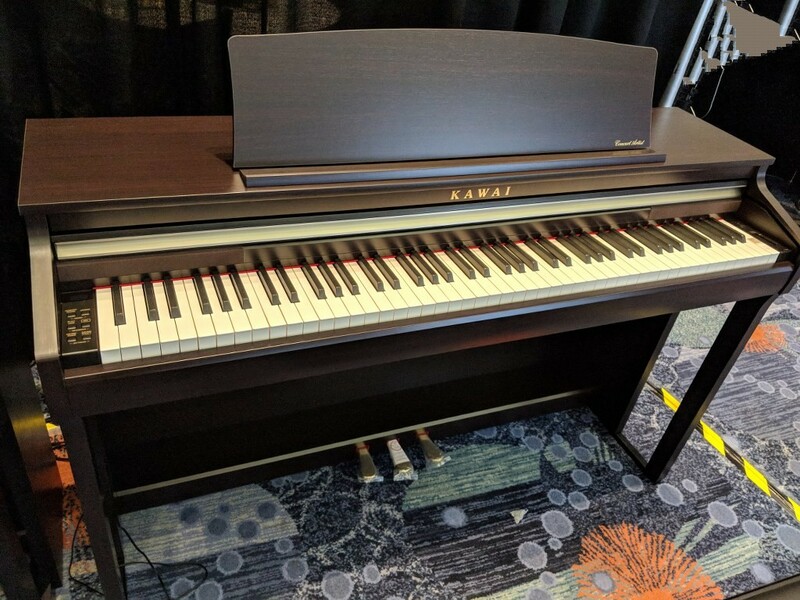 The Kawai KDP110 ($1199 internet price) in the lower price range is also a very good choice as is the Yamaha YDP163 ($1499 internet price for satin finishes). The YDP163 is a good choice but the Kawai, Casio, Korg, and Roland pianos do offer more bang for the buck right now based on what you get for the price paid in terms of a more realistic piano playing experience, in my opinion. There are really no bad digital pianos out there as long as you get a good reputable brand such as the ones I've mentioned. Also, price obviously has some bearing on the order in which I rated these pianos, so depending on what can afford, if you can spend more money then in many cases you will get more for that extra money. 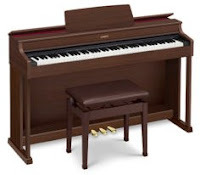 Even though I rated the Kawai ES8 as my #1 pick under $2000, the Kawai CA48, Casio AP650, Korg G1 Air, and Casio AP470 can be a somewhat interchangeable in position depending on what you actually want in terms of a piano, the way it looks (design, cabinet color, size, etc), and your musical goals. They all offer a lot of quality and piano playing realism if you can be in those price ranges. It just depends on what YOU like and how much YOU can afford to pay. Thanks, Tim, for the super analysis of these different brands and models. 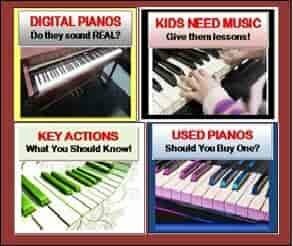 I am looking for a digital piano and your information is very helpful. Could you tell me which of these you would recommend for a choir? I am in an elementary school but I have always had a Roland digital in the schools I have taught in. I would like one that has a good quality decent speakers and recording capabilities so that I can record myself and they playback so I can conduct choir. I am a serious amateur pianist looking to sell my Yamaha acoustic piano (P22) and buy a digital piano instead due to my living situation (apartment with thin walls). I'm a fairly advanced pianist (I'm working on the 2nd ballade (chopin) currently) and need the best possible realistic digital piano under $2000. Is the CE220 still your recommendation (for 2013 March)? With regard to being under $2000, yes I recommend the Kawai CE220 over other new digital pianos in that price range for your needs. tim please i need your help !! im just starting to play the piano, and i dont know anything about pianos, but after saving some money for a long time i have 2.000 us to spend, is a great investment for me so im afraid of buying something wrong, in my country there is a used samick js-15 owner says is in perfect condition about 3 years usage, he is asking 2.000 us, and the other option is the Kawai CE220 that you recommended, i will be playing classical music, which one is the better option?, i appreciate your help thanks very much. Hey, Tim. Thanks for all the hard-work; Much appreciated. I was wondering if you had a 2013-update on digital-pianos under $3000? How does the Casio PX850 compare to the Casio AP 650 and the Yamaha DGX 650? Tim, How about a review of the Casio AP 650? Are you not mentioning it because it is not yet available? The AP650 is available only in a select few pianos stores in the US and not on-line. It is the upgraded traditional cabinet version of the lower priced Casio PX780 but with 256 note polyphony and a slightly more powerful speaker system. The PX780 is actually the better value and is available on-line too. Would you Please comment on how the Casio AP650 stacks up against the Kawai CE220? The Casio AP650 is a much higher priced version of the Casio PX780 with identical functions and key action but with 256-note polyphony instead of 128. As far as how the AP650 compares with the CE220 directly, please email me and I would be happy to give you a detailed explanation. Tim, I was looking for a piano for my three kids and me. Thanks to your reviews I am now feeling comfortable to choose one although I have never played a piano. This is a very passionate page and I really admire your engagement. How does the sound of the PX-850 compare to the AP-650? If money was not a consideration, which of the two would you recommend? Tim, Thank you very much for your great reviews and comparisons. I'm deciding between the Yamaha YDP-V240 and Kawai CE220. Since I haven't seen either one in real life, would you mind briefly comparing their cabinetry detail, finish, keyboard cover and overall elegance? Which would look best in your living room or den? 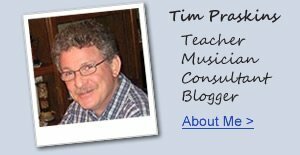 Hi Tim, great blogs. Keep them coming. Now that Roland rolled their FP-80. Which has the closest true piano feel/best key action between Kawai CE220, ES7 and Roland's ? An upright piano is out of question since access to our attic is a narrow circular stair. There is no "true" piano feel in the world of pianos. Even high quality concert grand pianos differ in key action feel and sound, that's why there are a variety of brands. One is not necessarily better than the other...just different...like green vs blue, oranges vs apples. All three of those pianos you mentioned are quite good but they are different from each other with one offering something different than the other. You could likely be happy on any of them so it's just a matter of taste, budget, cabinet design or portable, functions/features, etc. I personally could be happy playing on any of them. If you have other specific questions you can email me directly. I have an old 1990s yamaha clp142. My daughter is almost 7, been playing almost a year, I can play a bit myself as well although I never performed and prefer other instruments. Today we tried the kawai ce220, cn24, casio px750, roland rp301r. The store salesman said the cn24 is by far and away the best seller there. I definitely preferred the action feel to the ce220 myself. I thought the roland was fairly nice action wise, my wife didn't like the sound much. Something about the px750 (the px series in general even) doesn't feel quite right. Something about the key return? The only yamaha I've tried that felt like an upgrade over my clp142 is a yaris ydp181. My daughter didn't really have much of an opinion about any of them. With other kids starting in a couple of years we may need to add a second piano for practice time. Living in desert conditions I'm not really thrilled with getting something acoustic even though our aging piano teacher insists that acoustic is a must have (I don't totally agree and I learned on an acoustic). Please email me directly and I can give you specific advice based on my years as a piano teacher and pro musician. Hi Tim - thank you for the thoughtful and well-written reviews. I am a professional pianist and organist. I recently moved and my piano was unable to be moved up the circular narrow stairway and I have gifted it to a young girl in my church who is very talented but unable to afford a piano. That said, I'm utterly lost without it. I'm looking for the best digital piano I can get that sounds as much as possible like an acoustic grand, and feels as much as possible like one (and I do realize all pianos have different touches). My budget would be anywhere up to $2,500. What do you recommend? I don't care about any bells and whistles (other than that it would be nice to play in an apartment setting in the middle of the night (i.e., Beethoven at 2:00 am). Other than that, I don't need accompaniments, midi, different voices, etc. I don't even care about a display so to speak. I just want to feel like I have a piano again (as much as that can happen with a digital). What would you recommend? Thanks! Thank you so much for your great review. I have been reading them for a month and check some out in the store. I almost set my mind to Casio PX850 due to its connectivity, compact, 256 polyphony. But then I am introduced to Kawai CN24. I was told Kawai CN24 has smoother playing experience. But according to your review, KDP90 is very similar and much cheaper. I am trying to get a piano which will give my 5 year old son a great playing experience up to grade 5 if possible and can help to make his rhythm right. Most of the piano teachers suggest me to buy acoustic piano even just a second hand one. But I hope digital piano is good enough for up to grade 5, its much prettier, smaller and no maintenance. Hope you may be able to assist me with a decision. I don't know piano but look forward to learn together with my kids. I am looking to buy a digital piano in the under $2000 range, but wondered if there was much in the non-cabinet style that could be recommended? I maybe in a 'between' type scenario, as I would value something which is also a good synthesiser (or has good synth sounds), but am looking for the best piano sound/s (for my price range) and the feeling of authentic responsiveness from the key action. if you had any comments on the above, they would be most gratefully received. Hi, Tim!Congartulations for this very useful article.I`m An advanced piano player and I`m searching for a good digital piano with similar sound to acoustic piano as more as it possible and in the same time with low price-under 2000 $ because now I study music far from my home town.So, I tried some pianos but now I`m more confused because i`ve heart so many different opinions and etc.My qestion is - Is it important for the overtones the number of the tones polyphony? For the example Cawai CN 24 has 192 tones polyphony, Yamaha YDP - 162 has 128, Casio XP 850 has 256, Kurzweil MP-10 has 64.These are the models that i`m choosing from, so please help me! Hi Tim, Thanks for your work ! I'm from Italy. I studied piano for years on a bluthner grand piano in the house of my parents, but in my house I've only a poor yamaha keyboard. Now I want to buy my first REAL digital piano. It must have a classical design (yamaha/kaway) and a good sound, enough similar to acustic piano. I play modern music for my own pleasure and in my house, sometimes with the headphones but more often without them. I like nyman, sakamoto, einaudi. I'm not interested in accompainment/ rhytms ecc. I'm confused and I'm going to the shop to try: ydp162 / kdp90 (1000€) , clp525 / cn24 (1250€), clp535 / cn34 (1.580€). I really would like to buy a clp 535 but do you think the difference of price is justified?. 600 € is not little... Thank you for your replay. You are fantastic for offering this service to us. Thanks heaps! I have an (old) Yamaha upright piano, which in fact I can not play often as I normally arrive late at home. Therefore I'm planning to buy a new electric piano, which I can play with headphones and it is also portable, so if necessary I can take with me to a friend's house or during summer holidays. 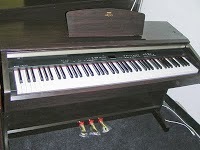 I've tried Kawai ES7 (which is around 1323 Euros) and Yamaha P255 (which is 1212 Euros). I’ve also tried Roland FP50/80 but didn’t like the FP50 and the FP80 is too expensive. My problem is that the trial of the ES7 and the P255 was inconclusive as it was very little time and I had to try them in separated shops (no side by side test). Can you give me your opinion regarding what will be the best choice? The Kawai ES7 is substantially upgraded in terms of realistic key action, piano sound, and pedaling response over the other pianos and is worth the price in that regard. what about kawai es 8 and yamaha p 255 ? does the kawai have the lower sound keys heavier? Hi i would like to start playing piano and i have got 2 offers for second hand digital pianos kawai cn3 and kurzweil mark pro twoi. Which one is better in realistic piano sound and touch key response? I am strongly looking at the px860 now due to your review. Was looking at the kawai es100 or kdp90 before but you really seem to like the Casio. As a beginner do think it's the clear choice? Also, what do you think of in terms of durability of the Casio? I have read people complain of loud clicking keys on the px850, have you witnessed this? Also, I have a question about the cn25. With its superior rhiii key action why did you not out it above the ce220 and es7 in your review? Thanks for everything. One further question. Besides cabinet design are there any differences between the px860 and the ap460? Sound, etc? Hi, thanks for the great overview. I'm a little puzzled why in your list of Yamahas you do not mention their Clavinova line, such as the CLP-500 series? I tried one of them and it sounded pretty good, though I have a Roland FP2 and like it a lot. What are your thoughts on the Yamaha CLP535 compared to the RP401R for instance? 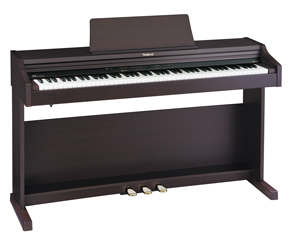 The Yamaha Clavinova series retails at well over $2000 with the basic model CLP slightly over $2000. They are only sold in piano stores in the US and not available on-line. Yamaha does not list internet discount prices so there is no specific price a person can buy one for under $2000. The basic model CLP525 is overall not much different than the Yamaha Arius YDP162 in terms of digital features except for the key action having 3 sensors instead of two. Even if the basic Clavinova 525 were priced below $2000 on the internet, I would still put it behind the models that Kawai, Roland, and Casio offer for the money under $2000. We have 4 options available at the same price here in kiwiland. Korg LP380, Kawai KDP90 , Yamaha 115B or Casio PX860BK. Each salesman told us theirs was the best! Beyond "my choice, what feels nice and looks pretty" Are there obvious differences here we are missing? Can you gives us a top 2 from which to pick? Thank you so much for being so non-biased and available from so far away! All four pianos would be just fine for a beginner and are good brands. The Yamaha P115 is smaller & portable and significantly less money in the States than the others, so I am not sure why that model is in your list? Nevertheless, My preference would definitely be either the Kawai KDP90 or Casio PX860 with regard to what I believe offers the most piano playing authenticity along with useful features. I can't tell you how much this blog is helping as I research digital pianos. I play, but haven't had a piano in the house for several years. Now, my children are beginning to get an interest in learning, and I want something that is authentic and that I will also enjoy. I've been considering many of the models listed on this page. I live in very rural AZ, and many of the models I am interested in are no where near me. For some, the nearest are 500 miles away, so demoing them may be impossible. I am looking for the best sound and feel. Currently, I am looking at the Casio PX860, the Kawai CE220, and the Yamaha YDP162. Of all these, if someone were to offer to give you one of the three, which would you prefer? ;-) Thanks very much. I also sent an email to you regarding to this question, thanks for the information about the Kawai pianos. I wish to know is the difference between Kawai CE220 and CN25 noticeable in terms of the Key action? which one is more authentic compare to the real acoustic piano? I know the CE220 uses AWA Pro II long wooden key and it is the predecessor of the GF keys, but the CN25 uses RH III key which is a later and newer version. I lean to buy the CE220 because i guess the key action might be better. but in case the CN25's key action is equally good. I will buy the CN25 because it offers the extra features like the piano lessons. one last question: I live in north Philly area, do you ship piano to there and how long it takes for the shipping? I am wondering why in this class you did not include the Yamaha P255 and how it compares say to the Kawai ES7/8 ? We are looking for a portable piano with a good hammer action (therefore not Yamaha P115) and if possible USB recording option (which excludes Kawai ES100). Thanks in advance. I am looking for a piano for my 9 year old who has been playing for two years now and would like to continue. I am looking at Yamaha YDP 142 and Casio PX 860 as possible options as both of them are in the same price range.Which one is better in realistic piano sound and touch key response? I am looking for a piano for my daughter(7 year old).She is playing for three months .I am looking at Kawai CN 35 and Kawai CA 17.which one is better in realistic piano sound and touch key response? Which I bay? First of all thank you for your reviews that help a lot in decision making. I’m currently looking for a digital piano for my daughter (9 years old), and I do not want to buy a piano that I will have to sell in One year because it is not good anymore. So I’m looking for a piano that sounds as good as possible with the most accurate touch, and with the possibility to plug a computer for learning lessons (even if my daughter is going to have a teacher), and honestly I do not care about the look (either with very beautiful cabinet or with light cabinet like ES8). Finally my budget was originally 1500€ almost 1600$$. My daughter has been impressed with the electronic features and potential digital effects even if I do not think that we will use them a lot. After different investigation I was looking at the Casio AP650. However I’ve read reviews where people were complaining about the “touch”, and/or the Sound (plastic/electronic). I know that this is not your position…. 8-). From What I’ve read in your reviews and what I can possibly listen in shops, I’ve a selection…. In France I’ve the opportunity to get the below pianos at those prices. 6. Casio Px 860 (950€ == 1100$$) - I do not think that this piano is in the course to be compared with others. My question is obviously, If I stick to my original budget and considering your reviews, the Casio is an excellent choice. But now, if I increase my initial budget by 300€ I can enter into another dimension If I understood correctly your reviews. Do you confirm that the Kawai CN35 or the Roland HP504 are Really above the casio AP 650. And finally If I go up to 2K$ I will have the saint Graal ! Finally based on what I wrote earlier, what would you recommend to me ? (considering that this is a first electronic piano for a beginner blablabla….). I'm fine to go go up to 1800€ (2k$$) which allows me to get the CN35 or the Roland or the ES8. Hello Tim, I'm deciding between the Roland RP501 and Yamaha CLP525 now. What do you think of the 2? This is my first time buying a digital piano, I've played a Cramer since young. My feel is that the Yamaha felt closer to a real piano though I didn't really like the thudding sound for fast pieces. The Roland felt easier to play though somehow I have reservations. Would appreciate your views on these 2 please. Thanks! The Roland key action is a bit noisier than the Yamaha but the Yamaha is noticeably stiffer to play than the Roland. So it is a matter of personal taste however I much prefer the Roland key action for speed and response and the extra "noise" does not bother me. Acoustic piano key actions are also noisy but you cannot hear the noise because acoustic pianos are always so loud. There are other options though and if you email me I can give you more info and advice. Your review says AP650 before the DP603 which is similar to the HP603. Does this mean the AP650 is better than even the HP603s?